Was Elvis a drug enforcement agent for President Nixon? Is Russia bigger than Pluto? 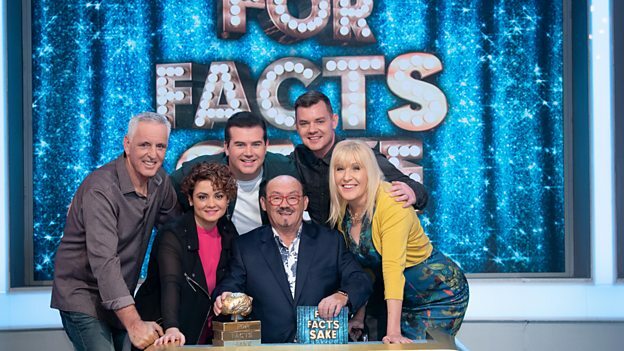 Mrs Brown’s Boys creator and star Brendan O’Carroll has all the answers in the brand new panel show For Facts Sake for BBC One. Brendan hosts the hilarious new show that celebrates ordinary people and their extraordinary facts where members of the audience are invited down to play the game. Two teams will compete in a series of entertaining rounds and games that uncover some amazing truths about the world we live in. With team captains from Mrs Brown’s Boys and celebrity experts expect laughs galore as the teams try to outfox each other with their fascinating facts and eye for true trivia.